Born in Dauphin, Manitoba, Barker joined the First Canadian Mounted Rifles as a private, later becoming a machine-gunner. Barker went to France with his unit in September 1915, and after weeks of trench warfare he transferred to the Flying Corps as an observer with the rank of corporal. In April 1916 he was promoted to lieutenant and soon after was awarded the Military Cross for his deeds as an observer-gunner. He then trained in England as a pilot, returning to action in January 1917. 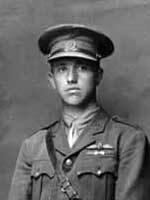 During his career, flying mainly Sopwith Camels, he destroyed 52 enemy planes, winning a number of medals, including the Victoria Cross, the Distinguished Flying Cross, and the French Croix de Guerre, and earning promotion to the rank of lieutenant-colonel at age 24. He joined the RCAF in 1920, resigning in 1924. After the war, Barker suffered from post-traumatic stress disorder (then known as neurasthenia). In 1930 he became president of an aviation corporation in Montreal, and he was killed when a plane he was demonstrating to the Department of National Defence crashed at Rockcliffe Airport in Ottawa. He is commemorated by Lt. Col. Barker VC School in Dauphin. There are clipping files and papers at the Archives of Manitoba.